The Sudden Cardiac Arrest Foundation estimates that nearly 326,000 people experience sudden cardiac arrest (SCA) each year. SCA is a condition in which the heart abruptly stops beating. This is not the same as a heart attack, which occurs when the blood supply to part of the heart is interrupted. Although SCA may be more commonly associated with the elderly, it can happen to young adults and children as well. If SCA is not treated within minutes, it can lead to death. AEDs are used to treat sudden cardiac arrest. So, what exactly is an AED? AED stands for Automated External Defibrillator. It is a lightweight, portable device used to deliver an electric shock through the chest to the heart. This helps to regulate and restore a normal heart rhythm. AEDs are placed all over cities and have become more user friendly over time. 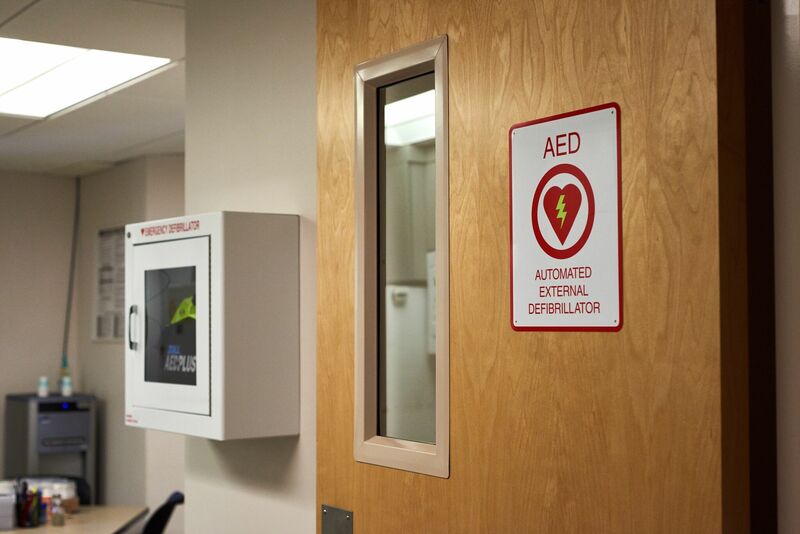 Heiden Orthopedics, along with the Play Well – Play Safe foundation(PWPS), understands the importance of having AEDs easily available in case of emergency. Together, they provided local high schools and community organizations with AEDs to have on hand. They have provided them for Park City High School and the US Ski team, among others, and would like to give more where they are needed. Beyond just providing these potentially life-saving machines to organizations in need, Heiden Orthopedics and PWPS take it a step further by training personnel on how to use them. An AED should only be used if there is a threat of cardiac arrest and should only be used after CPR has been performed. Proper training is fast, easy and lifesaving. Short classes can teach you what to do if your loved one or student has a pacemaker, hypothermia, chest hair, or is around water and requires emergency help. These classes are also available through the American Heart Associated, Health and Safety Institute, National Safety Council, and/or your local fire department or hospital. One such program provided by Park City Fire District is called “Push to Survive”. They urge Park City residents to take a few minutes out of their day to learn how to help someone in the event of an emergency. You can sign up for CPR or other medical emergency classes and find additional information on AED use on their website at https://www.pcfd.org/safety-education/classes/. We recommend having each new hire take a few courses or brushing up on emergency classes as a team. The physicians at Heiden Orthopedics recommend keeping your AED on the field during sports games and even nearby during training season. Since AEDs are portable, compact and lightweight, it makes it easy and convenient to have the machine on hand. It is also a good idea to have multiple people trained on how to use your AED. If changes are made to the staff, or if you just need a refresher course, Heiden Orthopedics will happily send trained personnel to help you learn how to use your AED properly. You can also have new staff view this video from the Park City Fire District. If you are keeping your AED near the field, do not use AED pads designed for adults on a young child. Children under 55 pounds will need pediatric pads as they deliver lower levels of energy. If your High School needs an AED device or training, visit Play Well – Play Safe today. American Red Cross. CPR/AED for the Professional Rescuer (participant’s manual). Yardley, PA: StayWell, 2006. (page 63).